Jonathan Manser and Matthew Knight have been instructed to act on behalf of a local restaurant in an investigation as to whether or not their energy meter has been providing accurate readings to their energy supplier. Matthew Knight was interviewed by the BBC South East about this matter https://www.bbc.co.uk/news/uk-england-kent-4758642... for both their news website and the evening news broadcast on BBC on Monday 18th March 2019. 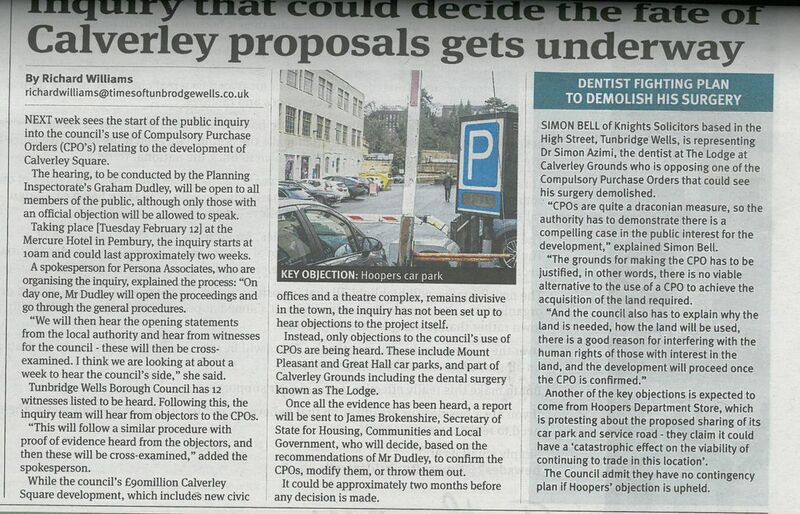 Knights are instructed to act for iSmile Dental Practice in the Inquiry into the Tunbridge Wells Borough Council (Calverley Square) Compulsory Purchase Order 2018 (the “CPO”) which is currently ongoing at the Mercure Hotel, 8 Tonbridge Road, Pembury, Kent, TN2 4QL. The Inquiry is anticipated to run until Friday 1st March 2019 and the Planning Inspector is currently hearing evidence from the Council and objectors to the CPO. As a result of the Inquiry, the CPO will either be confirmed (with or without modifications) or rejected by the Planning Inspector. If the CPO is confirmed, then substantive construction work on the Council’s scheme to develop a new civic centre, public square and theatre at the western entrance of Calverley Grounds will follow. This development includes the demolition of the Great Hall car park and the Lodge, in which iSmile Dental Practice is currently based. Given the considerable scope for disruption the construction has for local businesses and residents in the area and the costs associated with it, the scheme is being hotly resisted by a number of objectors who are affected. The Planning Inspector’s decision on this CPO could undoubtedly have a lasting impact on the face of Royal Tunbridge Wells, it’s businesses and residents. iSmile Dental Practice faces the prospect of closure should it not be able to relocate to alternative premises, leaving Tunbridge Wells with one less dentist for the local community as well as the closure of another local small business. Details of the Inquiry can be found here: http://persona-pi.com/ and is open for the public to attend between 10am-5pm. If you think you may be affected by this CPO or the wider development, please contact Simon Bell or Busola Oyenekan who are acting for iSmile Dental Practice. Simon Bell, Partner at Knights Solicitors, has featured in the Times of Tunbridge Wells Newspaper regarding the CPO relating to the development of Calverly Square, Tunbridge Wells, in which Knights acts for a key Objector. During the Christmas period Knights Solicitors will be closed on 25,26,27 and 28 December 2018. Knights will also be closed on 1 January 2019. The 24/7 legal helpline will be available throughout for emergencies. A long-standing client of Knights has featured in the Kent Life news for their charitable work done for the Manchester One Love concert. Matthew Knight, Senior Partner at Knights Solicitors who specialises in gypsy and traveller issues, has warned that changes in the law are having a profound effect on the way local authorities manage residential sites under their control.